Vintage Phonographs and Recording Devices. Radio Collection and Test Equipment Collection. 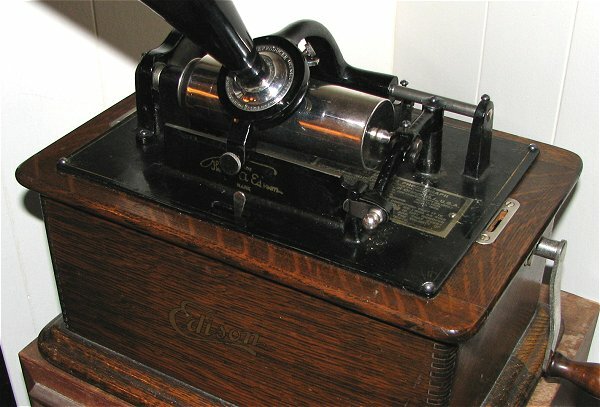 Produced in 1906, this 2 minute Edison Cylinder Player came complete with it's "Witches Hat" horn and the original finish. 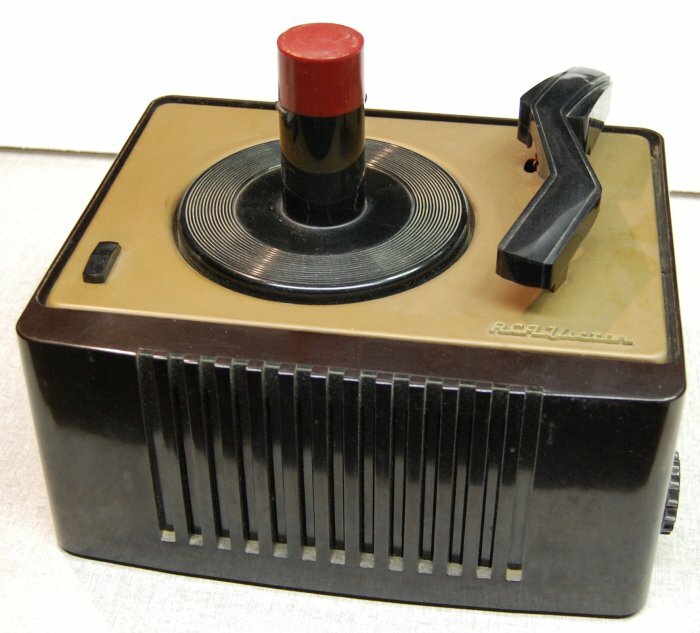 It's fitted with a Model C reproducer. Later models were able to play 2 and 4 minute cylinders. Canadian General Electric Model CJM-3 "Teardrop" 78 rpm record player. This Canadian made GE model CJM-3 Teardrop body and beautiful streamlined style bakelite tone arm were designed by John Vassos. 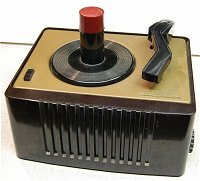 The Astatic cartridge used victrola type needles. There are two holders under the tone arm for storing new and used needles. This record player was designed to plug into and use a radio as the amplifier. 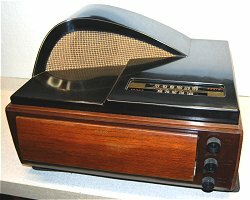 There was also a similar model HM-21 that contained a wireless transmitter to broadcast to an AM radio so no direct hook-up was necessary. General Electric Model 16 "Teardrop" 78 rpm record player. 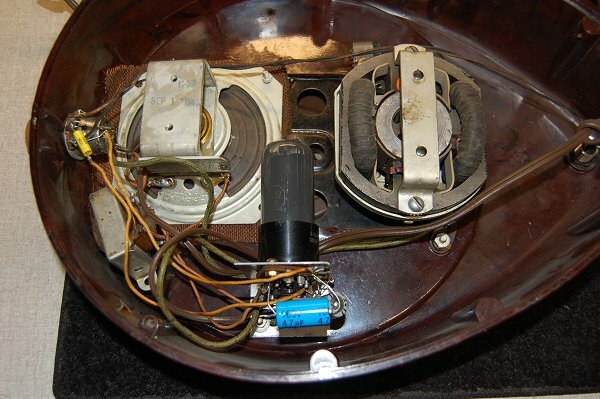 This U.S. made GE model 16 Teardrop record player has a one tube amplifier and speaker. I don't think the amp was original. I suspect from the construction and use of a Crosley speaker, it was added so it would not require the use of a radio. 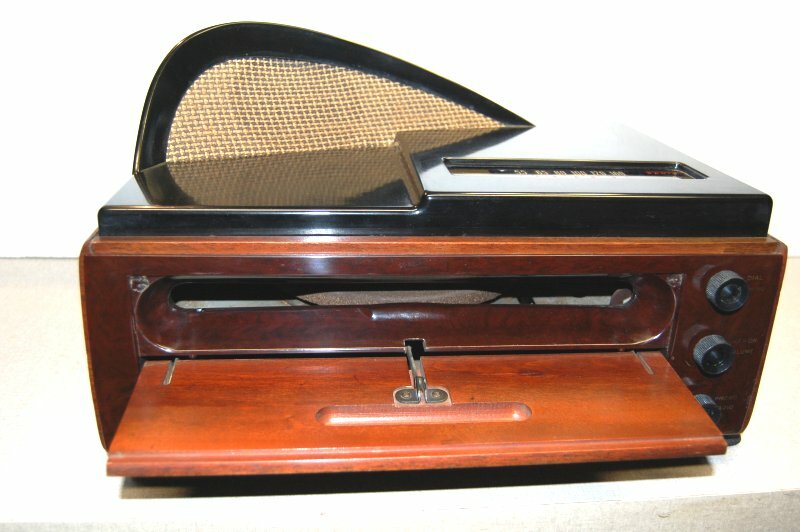 I do not have any data on this model record player yet. You will notice from the photo that it did not have the bakelite tone arm of earlier models. 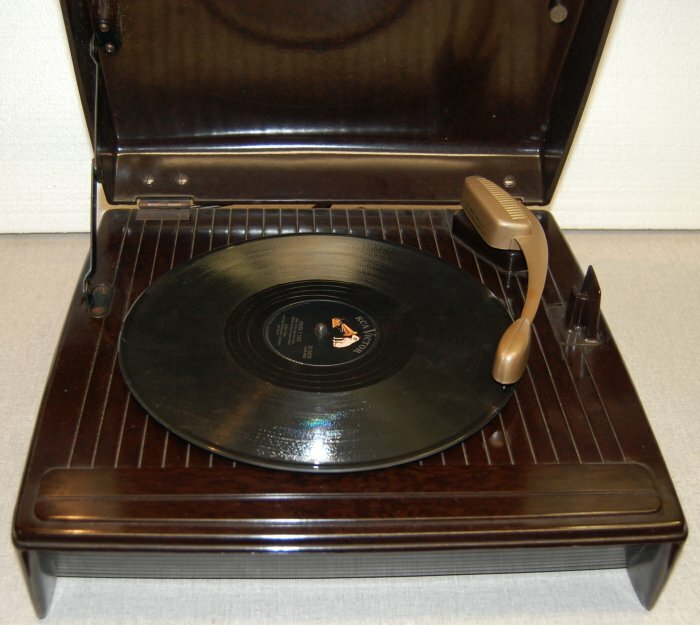 This Philco radio/phonograph was produced in 1949 and plays 10" and 12" 78 rpm records. It contains Philcos M-7 automatic record player. Just slide your favorite record in the front. It starts automatically. 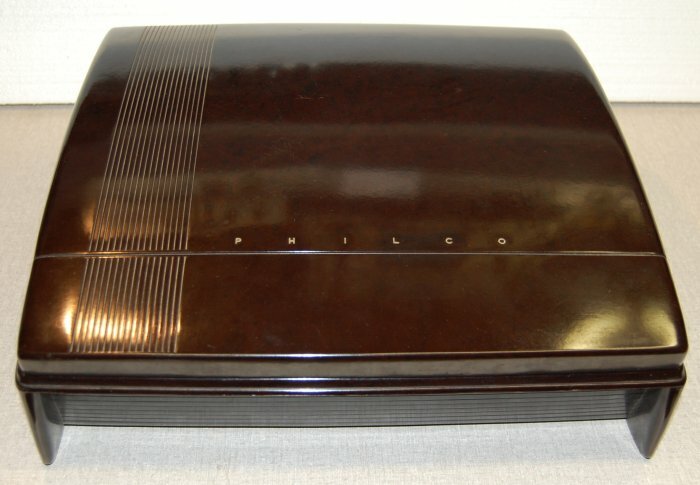 This Philco M-15 record player was designed to play the new "Vinylite" Long Playing 33 1/3 RPM records and to plug into Philco radios with a phono jack input. 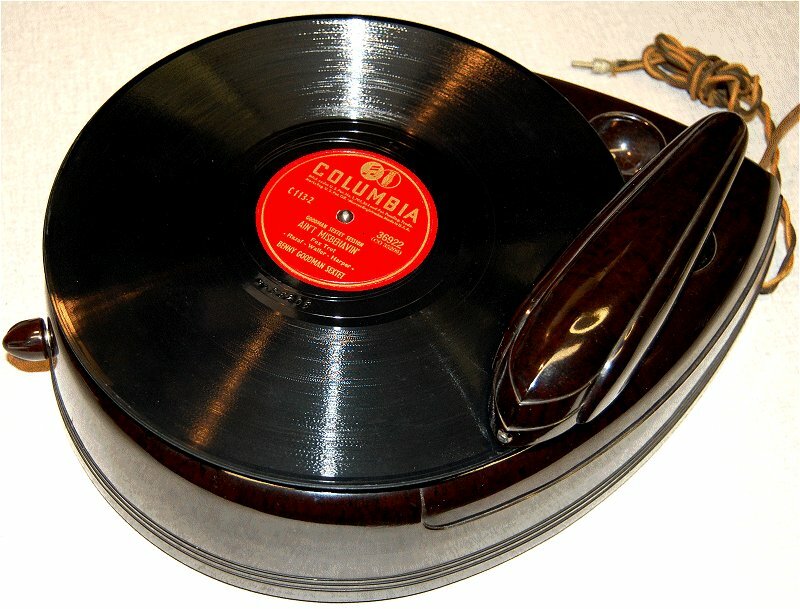 This RCA 78 RPM record player was designed to plug into RCA radios with a phono jack input. 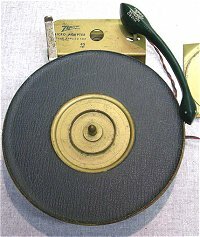 A volume control is located under the tone arm. When not in use the tone arm pushes down to be stored flush with the top. 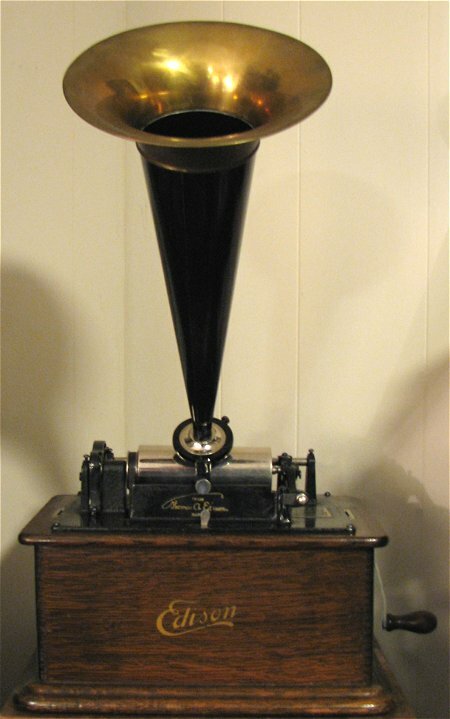 This is a early RCA 45 RPM phonograph. Designed to play up to 12 7" 45s at a time. 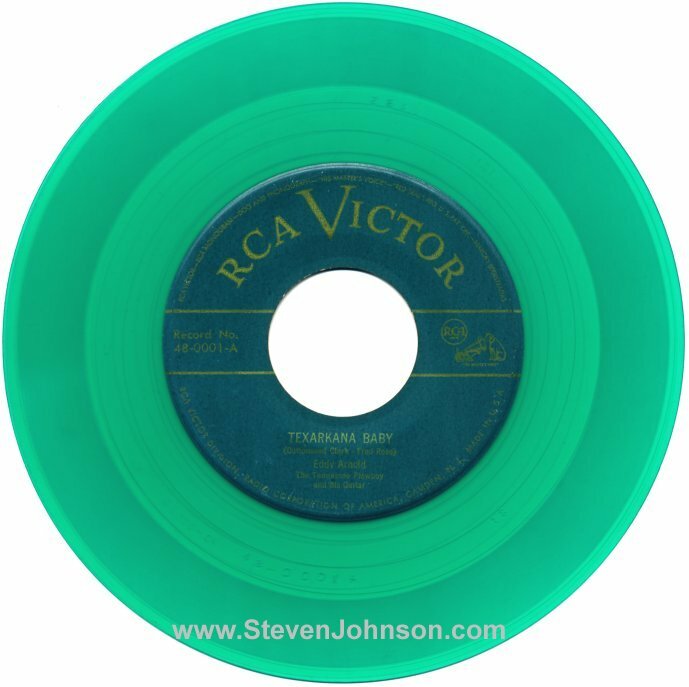 This is the first 45 RPM record commercially released by RCA. 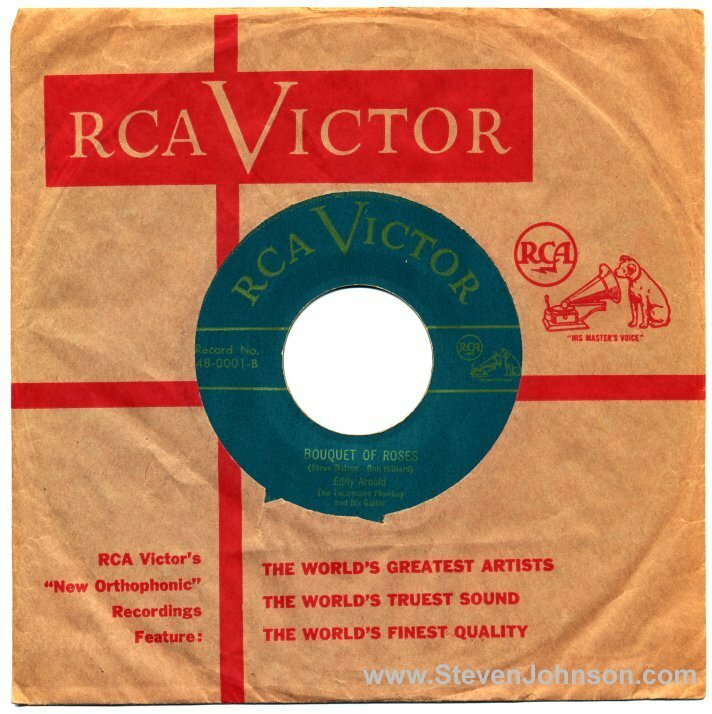 It's RCA record #48-0001 by Eddy Arnold. A side is Texarkana Baby, B side is Bouquet Of Roses. 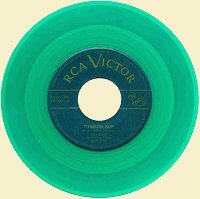 Part of the first set of 45s released, Texarkana Baby is the first number in that set. The first 45s were color coded, county & western green, children's records were yellow, classical red or dark blue, rhythm & blues orange, and popular songs were black vinyl. A RCA pre-release 45 demonstration pack was sent to record stores in February of 1949 but was not for sale to the public. 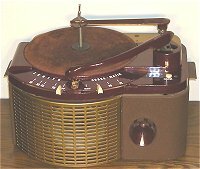 Zenith Model S-9010 uses Cobra-Matic changer S-14055 and amp chassis 4L02 Designed to play up to 12" records, this changer is designed with variable speed from 10 RPMs to more than 80 RPMs. Note the snake shaped tone arm and the Cobra shaped record pressure bar. 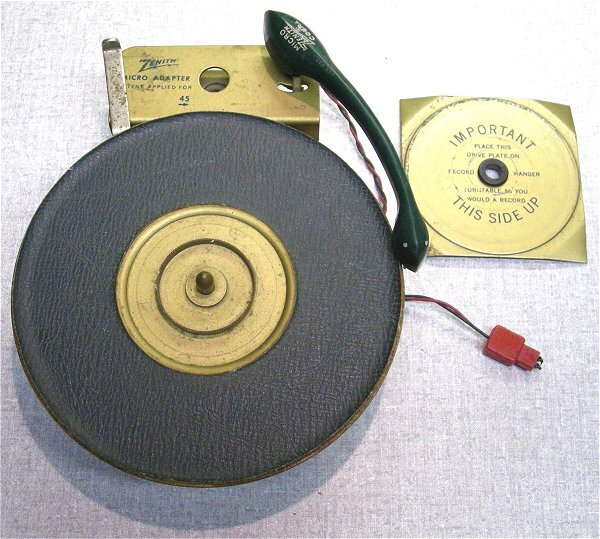 This Zenith Cobra-Matic Micro Adapter was designed to allow the playing of 33 and 45 RPM records on a Zenith 78 RPM Cobra-Matic record player. 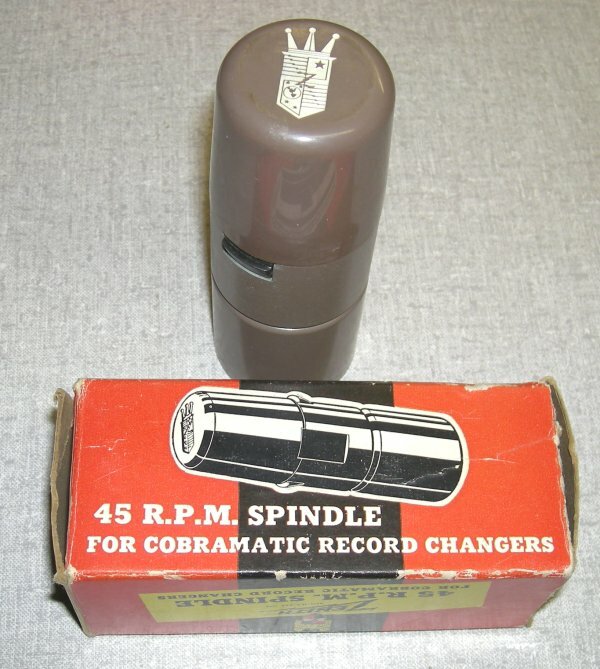 You placed the adapter over the spindle on a single speed 78 RPM Cobra-Matic record player using the hole by the tone arm. 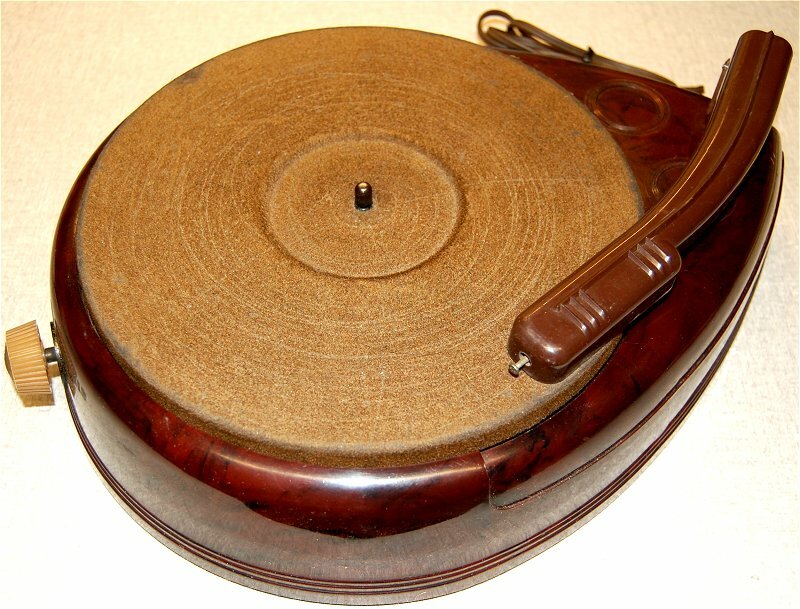 A rubber wheel underneath rode on top of the 78 RPM platter and drove the adapter at either 33 RPM or 45 RPM. 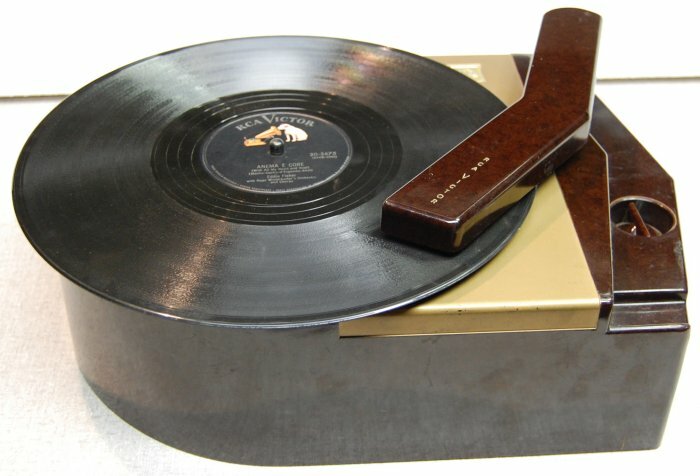 The lever moved the rubber wheel further out on the 78 platter for 45 RPM or toward the center for 33 RPM. 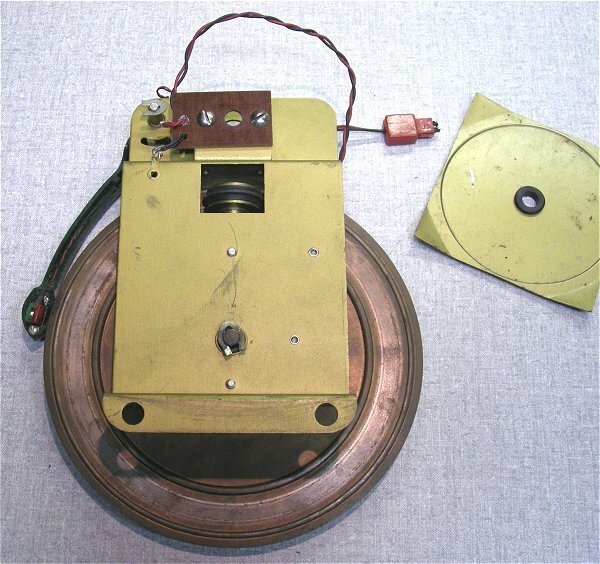 You removed the cartridge on the 78 RPM Cobra-Matic tone arm and the tiny Cobra-Matic tone arm wires plugged into the cartridge holder of the larger 78 RPM arm. 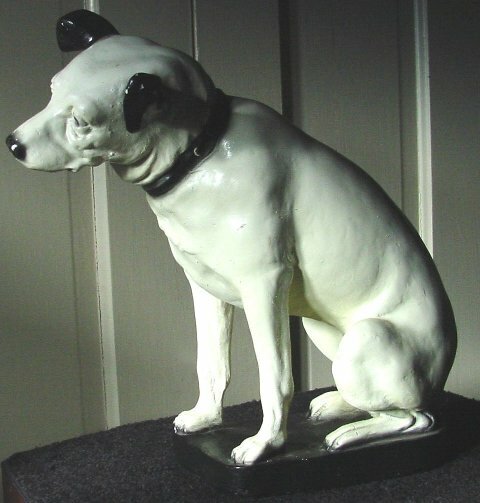 This beautiful clay statue of Nipper the Dog, (His Masters Voice) is 14.5" tall and weighs in at 9 lbs, 2 oz. I purchased it from a retired RCA employee that got it at the employees store at the RCA plant in Mountaintop PA in the late 1960's or early 1970's. 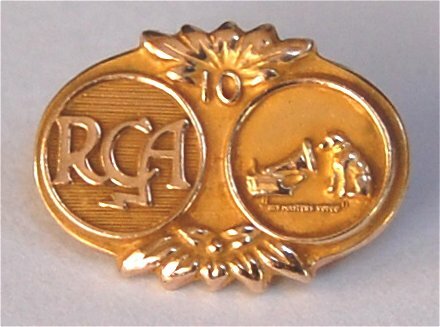 This beautifully designed RCA Victor 10 Year Service pin is 10K gold and only 5/8" wide. 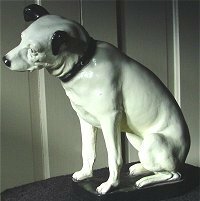 It has the classic RCA logo on the left and Nipper The Dog on the right over "His Masters Voice". 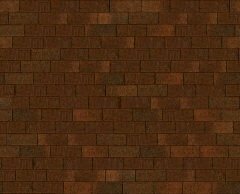 The back is marked 10K over "LEAVENS".